So, you want to take your handpan on vacation with you? You want to play at the top of Machu Picchu? You are invited to give a concert abroad? You want to repatriate an instrument? You are visiting friends and you want to introduce them to the handpan? 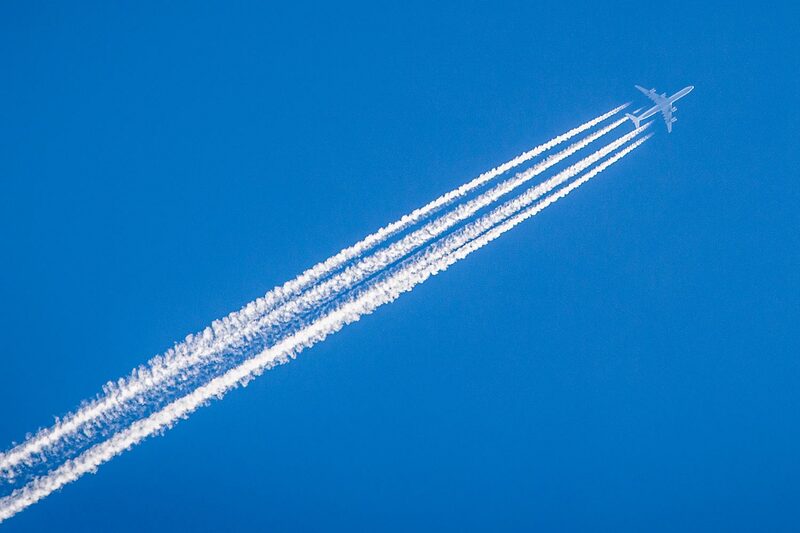 Even without an instrument, traveling by plane is quite stressful There are hoards of people, confusing billboards, a hundred labels to stick on your cases, passports to scan, luggage to prepare, shuttles not to be missed, security to pass, and more. And, if that was not enough, you’re now adding the stress of the mobile musician: you’re carrying your instrument with you! Yes, I am talking about your rare and expensive instrument. The one that can easily get out of tune and which is, for some brands, irreplaceable. In this article, I would like to share my ten years of experience travelling around the world with my handpans. My goal is to remove all worries and give you as much information as possible, along with a few tricks. Before you start, please be aware that I only protect my instruments with cases and accessories from Hardcase Technologies (HCT). They are the highest quality available! 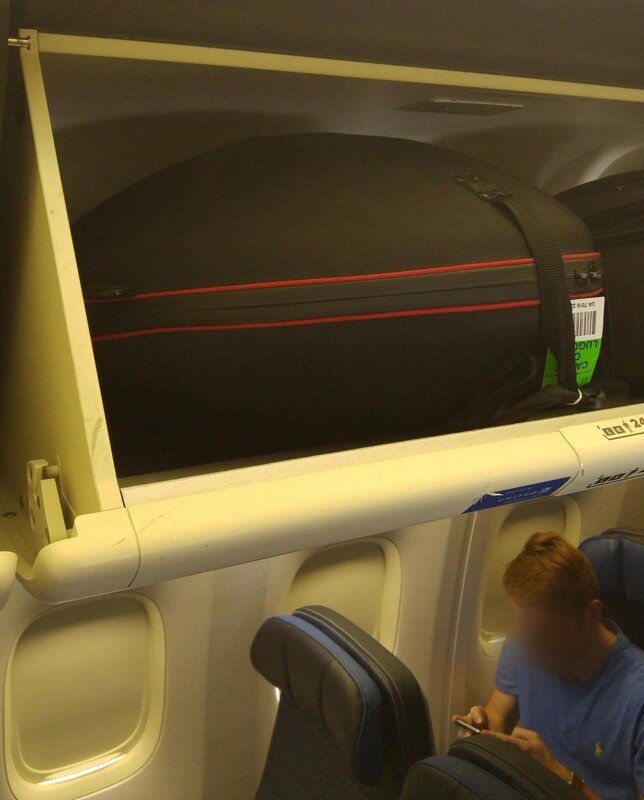 My advice and tricks about sizes and if it fits or not in the cabin, are only for instruments protected by these cases. I use the Evatek Medium model for ALL my instruments. If you are interested in using a different case brand, I encourage you to ask other users for advice. If you have an Evatek case from HCT, you can trust me blindly. So, here’s all you need to know about flying with your handpan. 1. Can my handpan be considered as carry-on luggage? Yes, you can take your handpan with you in the cabin. Even though it is bigger than all the carry-on luggage templates you will find, 99% of the airlines understand that you are a musician and they will accept your instrument, even if it is too large. My instrument was not accepted as carry-on luggage only once in 10 years. It was with EasyJet, in Athens. That day, there were lots of crazy people, several flights delayed, the crew was over-stressed, and me … hyper disgusted. They refused my handpan because it was too big for a carry-on bag. Apart from this isolated case, the other low-cost carriers have always accepted it. I will come back to these companies later in the article. Note: Some low-cost airlines do not accept carry-on baggage of more than 8 kg. Be aware that your handpan (no matter its brand), put in a Hardcase Technologies Evatek medium case, weighs no more than 8 kg, even with the “fly kit“. Reminder: With these low-cost airlines, you are entitled to only one piece of carry-on luggage. So make sure you have nothing else, not even a computer or a small purse. They are very strict on that. Tips: If you do not want to check in luggage, you can put two or three T-shirts and some underwear inside your instrument. With airlines, every little bit always helps. 2. Does it fit into the cabin compartments? Tip: I always have photos of my handpan in different compartments to prove my point. What are those 5% of planes where it did not fit? Small aircraft that are often taken for connections in the USA, for example, between two small towns, usually will not fit our instruments. Also, to my surprise, on a United Airlines flight between Geneva and New York, the plane had very small compartments (I only saw it once on such a large aircraft). Tip: When traveling on a Europe-USA long-haul flight, if it does not fit into a compartment, ask the crew if you can use the closets that are in first class. They are often empty and your handpan fits in perfectly. 3. Can I check-in my handpan? Yes, of course. But, if you want to put your instrument in checked luggage, it will be necessary to have a very rigid cover, because checked-in luggage is often mistreated. I strongly recommend that you protect it in a Polycase or Evatek case, and the addition of the fly kit is mandatory. You can find all this on the Hardcase Technologies website. You can then register your handpan like any other luggage. 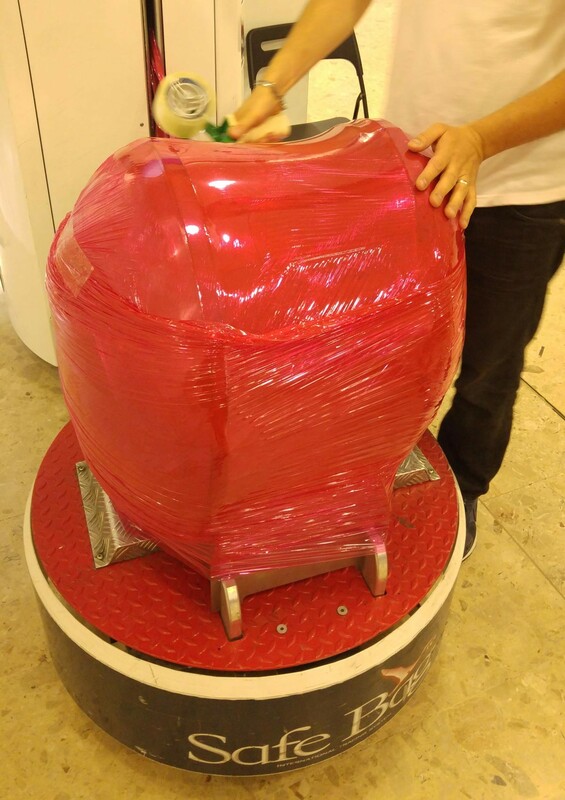 Because of its size, but also because it is a musical instrument, you may be asked to deposit it in the “Oversized luggage” check-in. Tip: To avoid a fright on arrival, remember that the special luggage recovery belt is located somewhere other than standard luggage. So you have not lost it! Follow the directions and find this famous belt. 4. If I have several handpans to take, what should I do? In the cabin, large airlines allow 2 items of carry-on luggage. Even if your handpans are large, explain the situation to the crew. They often accept them, especially when the flights are not full. Tip: In general, I put all my instruments in Evatek covers with Fly Kit. I try to take two in the cabin, whatever the airline If they accept, bingo! If they refuse, at least I can make them leave one in the hold knowing I gave it a try. Why is the second one also in an Evatek + Fly Kit? So that if, for some unexpected reason, I am asked to put it in the hold as well, I am prepared for every situation! That makes a total of 5 handpans, for the price of one piece of checked baggage. Hey, we can perform a concert with that!All you have to do is put your clothes in your instruments and iron them before climbing on stage! B. You can buy a large military bag and secure the two instruments in it. It’s just like wrapping your instruments together. This option is even less expensive, because it allows you to reuse your packaging material each time you travel. 5. I absolutely want my handpan in the cabin, so how can I stack all the odds in my favour? As mentioned at the beginning of the article, there is always a tiny possibility that the airline will refuse your instrument in the cabin. So here’s how I do my best to make sure it is accepted. You may think that I go a bit too far, but believe me, depending on the country, the rules, the airlines, the mood of the staff, the rush, etc., you may find yourself stuck. So I learned to put in place little tricks that have often saved me worry..
A. Arrive early: I go to the airport as soon as possible,at least 2 hours before the flight. I arrive early to show the airline that I have the concern that my luggage is taken care of and that I am not asking for favors lightly. B. Explain: I go to the luggage check-in counter and make it clear to them that I am travelling with one or more very rare and very valuable musical instruments. They often appreciate the fact that I do not act like “I’m a crazy artist who arrives late and has special demands”. C. Charm the staff: if there are only a few waiting people, while opening the cover of my instrument, I ask them if I can play for them a few seconds. “Come on, I know you’re at work, but I’m playing a little piece, just for you.” Generally their colleagues come to listen, too. They are often the very same staff that are found at the flight gate. So if they can recognize me later, it’s to my benefit. You know the “handpan effect.” They like it! Once my little performance is finished, I repeat: “You see, it’s unusual and very fragile, I really need it in the cabin with me.” You’ll see, it works.Note: this point is very useful for small low-cost airlines that are very strict about the size and number of items of luggage in the cabin. D. Be the first to get on the flight: depending on the flight, I then take one or two handpans in the cabin with me. If I see that there are a lot of people at the gate, I do not hang around. I try to get on board fast! Why? Well, what happens is that if the flight is too full, they ask the last 20-30 people to register their luggage for free and put those in the hold. And that, I don’t want to do that. I insist that it is my instrument, that it is rare and fragile. 90% of the time, it is accepted onboard. Remember that I still have my handpan in an Evatek + Fly Kit if there were no other solutions. It’s really important not to wait to board. I even encourage you to pay a bit more for your ticket by checking the “Early boarding” option, which will guarantee that you board faster. Note: Obviously, item D is only relevant for small flights. Indeed, on the long flights, the boarding is done by group of passengers. Anyway, do not worry. Big companies will not bother you for your handpan in the cabin. Tip: To avoid paying the “Early boarding” fees, you can also ask at the check-in desk which seats will board first (example: group 1, seats X to Z). Then, choose one of these seats. But, once again, for long flights, there will always be room. 6. Are there any special precautions to be taken in relation to customs? Yes! 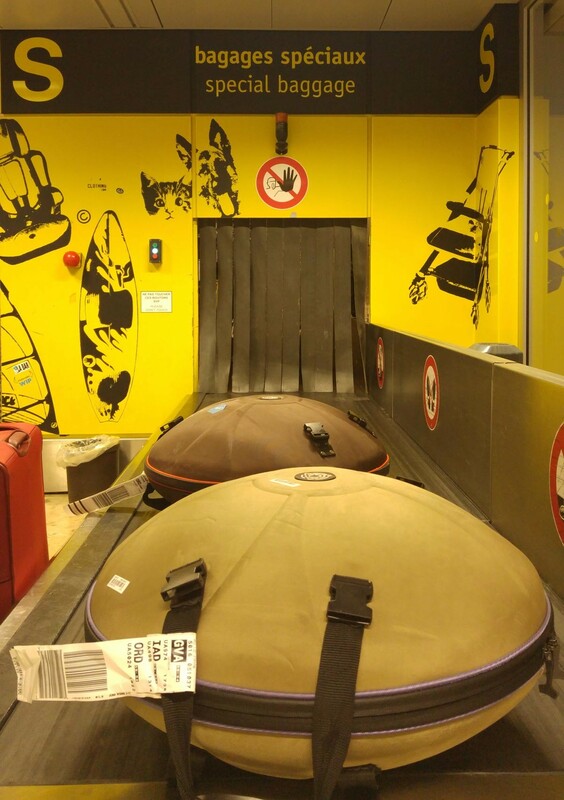 When sent as checked luggage, your handpan may be opened by customs officers and inspected. 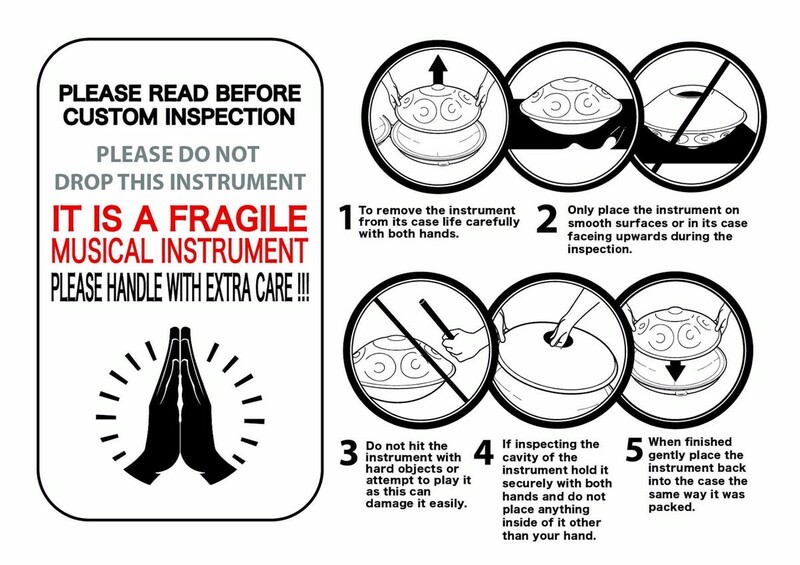 Unless your instrument is inspected by a handpan-playing customs officer, there is a good chance that it will be handled incorrectly. Here, below, is an excellent card created by Chris Ng to be sent in your handpan case. It is intended for the customs officer who will open the baggage for verification. The idea is to put the card inside your cover so that the controller can see it by opening it. You can download it here, in several languages. 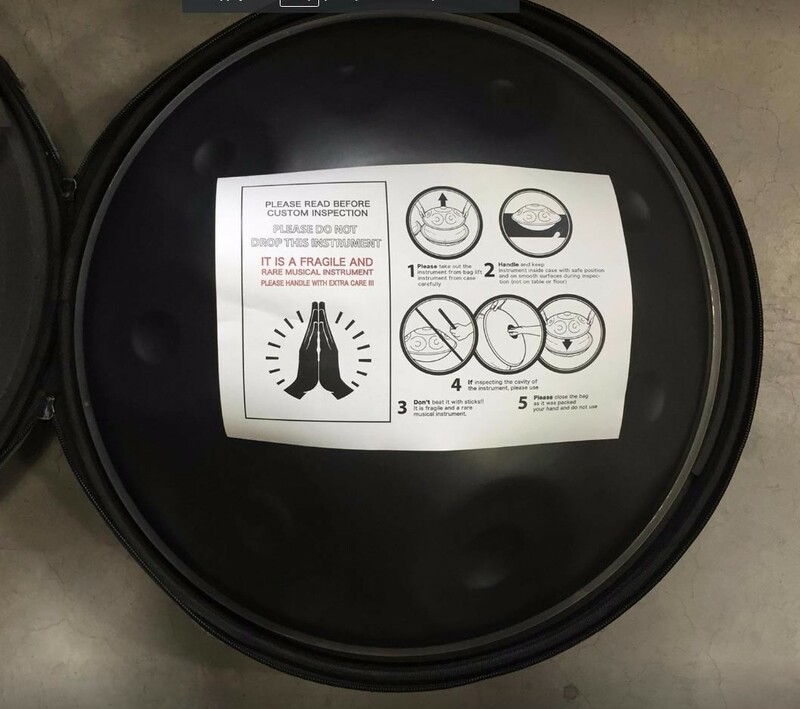 Be calm, learn about the airline and the staff, and play a little handpan – it will do them good, given the difficult days they have to endure at work. Have a good case, anticipate, arrive early, be polite … In short, take your precautions, put all the chances on your side and … enjoy your flight! What about you ? Have you already carried your handpan on a flight? Do you have any advice to share with us? Do not hesitate to share your experience by writing a comment below the article.